This is a slightly unusual way to prepare runner beans. A lot less boring than your steamed / boiled variety. Please see the step-by-step instructions. I use a peeler to take the sides with the stringy bits in them off. 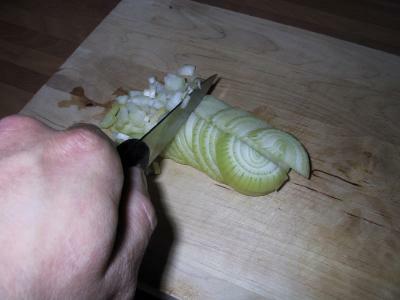 You can do that with a paring knife as well. 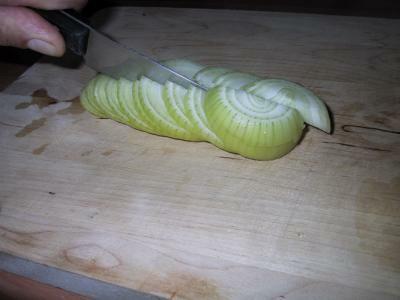 Chop the onion - first into slices, then half the slices. Then cut them into small strips. 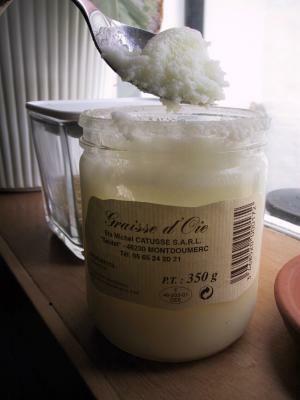 Put the goose fat into a saucepan (alternatively, use some olive oil). Cut the bacon into squares. 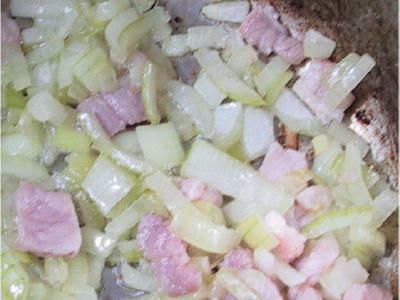 Heat the saucepan and fry the onions together with the bacon until the onions start changing colour. Now add the chopped beans. Add salt and pepper and the oregano. 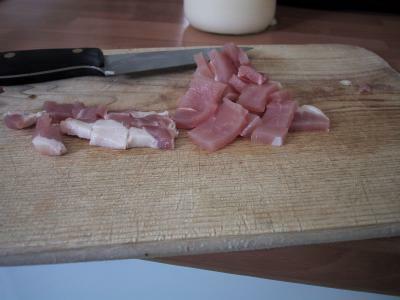 Careful with the salt as the bacon will already contain a fair amount. Stir, put the lid on and turn the heat low. The idea here is to cook the beans without adding water - there is enough moisture in them so they won't burn. 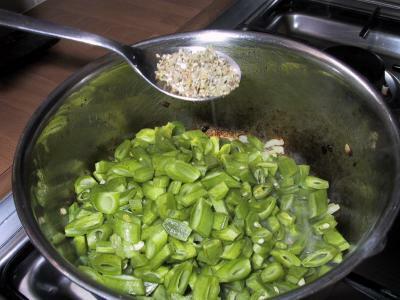 The trick is not to lift the lid too often, nor to use too much heat - and to stir them once in a while. After 20 minutes, they will be done. 10 Yes, very nice dish and made a lovely change from steamed. Also works with broccoli and Broccolini, full of healthy nutrients. Enjoy! 9 Absolutely lovely and so simple to prepare. 10 Absolutely delicious. The oregano really gives it power! 10 It would really help if you gave some kind of dialets-this could be anything from an appetizer to a dessert, with the only limit being 40 minute prep time and easy . I guess I would suggest either sandwiches or a meal salad like a chef salad unless you want to do a dessert like cream pie made with instant pudding, ice cream sandwiches or fuit salad. 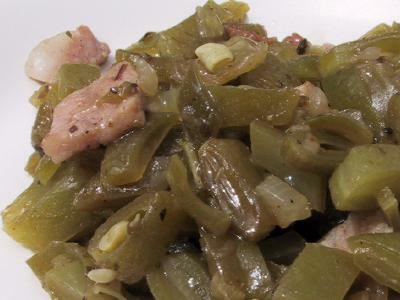 10 Just tried this with home grown runner beans, and I have to say it tasted great. Will be cooking it many more times I m sure. Thanks. 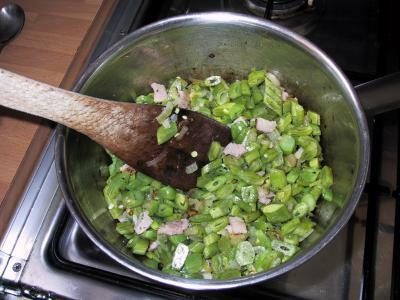 10 I am not a veg lover but this runner bean recipe is excellent - so tasty. I add a little garlic too. 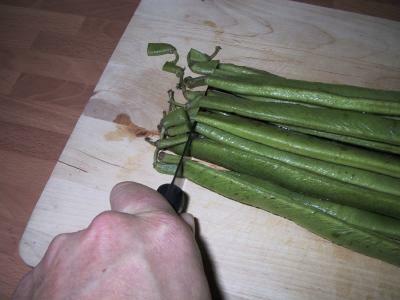 10 When the kids were younger, they would only eat runner beans this way. Now the grandchildren love it as well. It smells divine and tastes scrumptious. Thank you for sharing the recipe. 8 Delicious but I think I must have cooked beans too long they were a bit soggy ! I have seen similar idea using sprouts instead of beans. Great way to get reluctant veg eaters to try it! 10 Wish you had a print option for just the script and without the pictures. 10 Fantastic recIpe, tastes super. At the end I cook beans for only 3 mins, leave it cool down, portion it and freeze it. When defrosted, cook for further 3 mins, beans are stil crisp and flavour doesn't suffer. 10 Thank you for a fantastic recipe. I add lots of garlic and cokk only for 5 mins so the beans are crisp. 9 Ecsellent- Runners Beans recipebook? 7 But it doesn't look good! 8 Well presented and easy to follow. 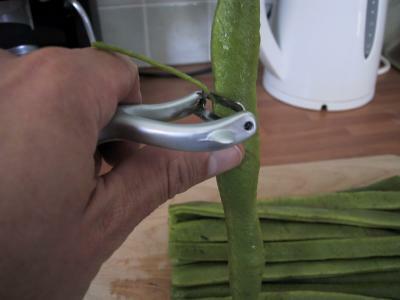 As runner beans are such a delicate flavour, they loose a lot of their appeal, when frozen to use up a harvest surplus. This could be used to perk up frozen beans. 5 Sorry, but it looks awful actually , hope it tastes better..
10 I'm a bacon addict so I doubled up on the bacon and threw it in first to get a bit of colour into it. It was AWESOME!!!!!! 10 This was great. I think I like green beans now. 10 Great recipe. Works really well if you use a bean slicer/stringer gadget found at cooking shops. The best way to cut the scarlet runners we've found. 9 Excellt, always looking for new ways to cook veg and this was really tasty ! 9 really loved it, wish I did it with panceta instead of the bacon though. So delicious! 10 This sounds delitious, will also try without bacon, and after cooking add greek yougurt on. and eat cool. 10 The photos were very helpful and great simple instructions! 10 I added large garlic clove in with the onion - was lush. 10 Looks very good. I was reading a book and the author mentioned runner beans. Had never heard of them. I'll try them someday. 10 Very good. Thank you. 9 Excdellent - I really dont like beans but this was delish - thanks! 10 I tried something the same using small cubed bits salami, it was great. 10 Really love the way it was explained and shown. Will definitively try. 8 i do this with Brussell sprouts too! Delicious.